Thank you for choosing Bombora to create a bespoke timber vanity / vanities for your home! We look forward to collaberating with you to create your prefect pieces. In this blog post, we answer some of our clients most commonly asked questions after they have chosen to work with us! The online order form, sent through to you on emial, confirms that the information on your invoice is correct and also collects vital details from you about your timber and waste hole locations. We need all of this information before we put together your design drawings. We need the drawings approved by you at least 5 weeks prior to your estimated completion date to ensure that we have all of the componants ordered and ready to go. There is some details that you will need to have confirmed prior to filling out this form. The exact dimensions of your vanity. This includes the height, depth and width. We understand that these sometimes change slightly through the building process. We can have estimates of dimensions to start the design drawings however we will need the confirmed dimensions at least 5 weeks prior to starting production. The colour and thickness of your stone if you have chosen this option for the bench top. 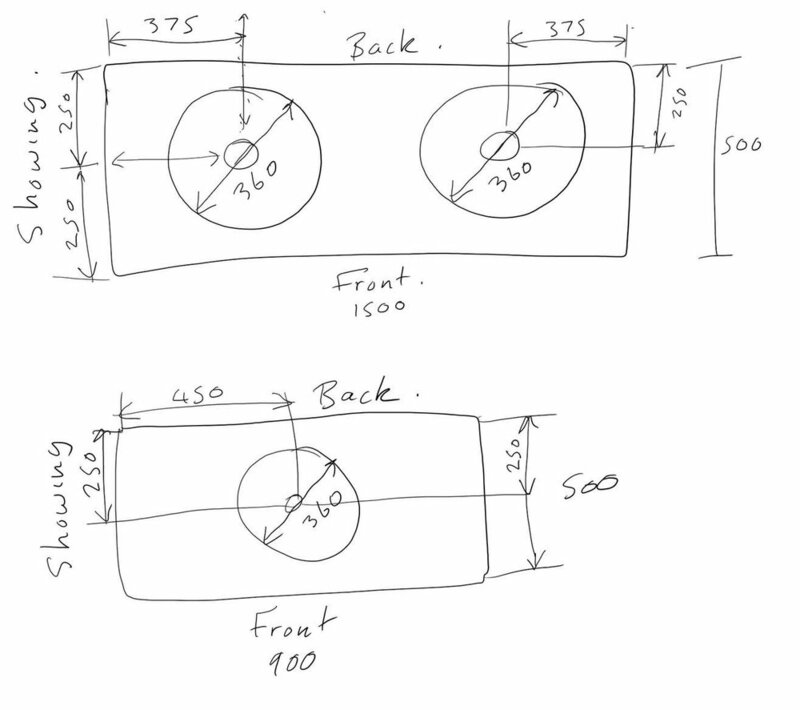 What is a waste hole location drawing? In the waste hole location drawing, we find out from you the exact location of the waste hole/ holes and also the diameter of these holes. You can find the information on the required waste hole diameter in the specification documentation that comes with your basin and tap. Below is an example of a drawing. As all of our vanities are made to order to your specifications, there is no standard setout that is required for the plumbing. Your plumber will be able to use the waste location drawing to determine where to rough in the pipes in conjunction with information from you on the location of your vanity on the wall. We allow a 100mm clearance around the waste hole location to fit the pipes. This clearance is either a u shaped drawer or a cavity. In the case of a cavity, the dividing section of timber is designed to be removed to make installation of the pipes easier. Ideally, your tiling would be completed after your vanity has been installed. This allows the tiler to bring the tiles to the top and sides of the vanity then silicone the join. Occasionally because of timing, this is not possible. In this circumstance, a template at the dimensions of the vanity can be attached to the wall as in the image below. We suggest leaving the wall surface where the vanity is to be attached free of tiling. This is because it makes it very challanging for your builder to find the studs once there are tiles on the plaster and drilling through the tiles can crack them. If your vanity is to be attached to three walls, we recommend that you provide us with a template of the bench top as walls are not always straight! We have been a part of enough builds and renovations to know that delays happen. If you are running behind schedule, we can move the production of your pieces back to when you will be ready to recieve the delivery. Please note that the date you where supplied as your completion date is an estimate only. As we create everything by hand, there can occasionally be unexpected delays. The estimated completion date for production not the delivery. As deliveries are completed by external companies, we are only able to advise you of their delivery date once the booking has been made. We have several different companies that we work with for the deliveries and send the item with the company that will get it to you first. If you have any queries, you can contact Alison on 0407 906 799 or Luke on 0437 748 828.